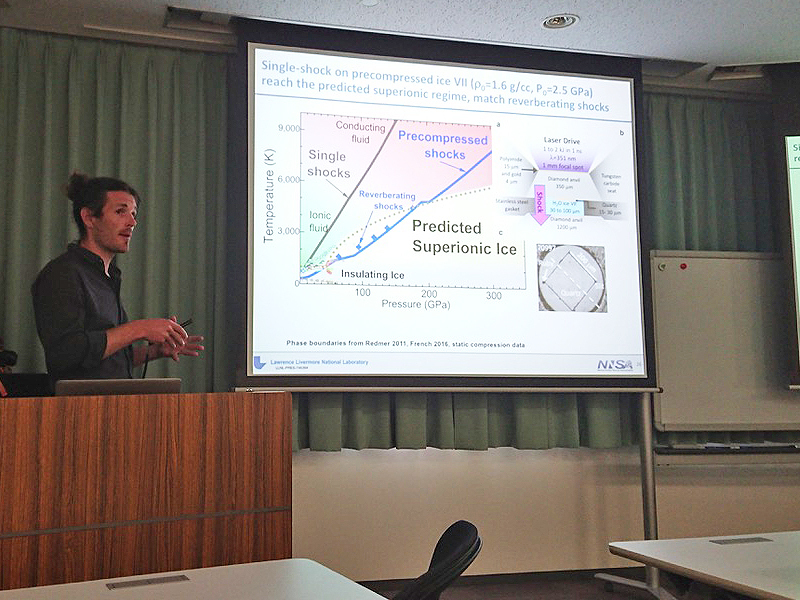 講義の概要 The pressure-temperature phase diagram of water exhibits a striking degree of polymorphism with more than 15 polymorphs of molecular ice and the pressure-induced transition to the ionic ice X near 70 GPa. Upon further compression and at elevated temperature, several molecular dynamics studies have predicted that water becomes superionic, an extraordinary state with liquid-like hydrogen ions diffusing within a solid lattice of oxygen. The higher entropy of superionic ice is expected to rise its melting temperature to several thousand Kelvin and to favor the transition to new ice structures having a close-packed oxygen lattice. We will report experimental evidence for superionic electrical conductivity above 100 GPa and 2000 K using velocimetry, pyrometry and optical property measurements of shock compressed water ice VII, as well as in-situ x-ray diffraction of ice up to 4 Mbar using reverberation compression showing that the superionic conduction indeed exists in the presence of a solid oxygen lattice as predicted three decades ago. The new XRD data also suggest the discovery of a new solid ice phase having a face-centered-cubic oxygen lattice. In addition to providing new benchmarks for quantum theory of condensed matter, our laboratory experimental study suggests that Neptune, Uranus and many icy exoplanets may contain significant amount superionic water ice, in contrast with the prevalent picture of fluid interiors for these objects. 講義の概要 The presence of light elements alloyed to iron in the Earth’s core is well established, and core formation models based on metal-silicate equilibration point at silicon as one of the major light element in the inner core. However, attempts to constrain silicon abundance on the basis of comparison of velocities and densities of iron and iron alloys at high pressure and high temperature with seismic observations so far did not provide a unique answer. In this talk I will present sound velocity (compressional velocity VP and shear velocity VS) and density (ρ) measurements on Fe and Fe-Si alloys at high pressure and high temperature obtained by complementary use of xray diffraction, inelastic x-ray scattering and picosecond acoustics. These results, combined with previous experiments and calculations, allow a precise determination of the VP-ρ and VS-ρ relations for Fe and Fe-Si alloys, and consequently to address the effect of Si on the velocities in the Fe-FeSi system in the range of Si concentrations 0 to 9wt.%, applicable the Earth’s core. 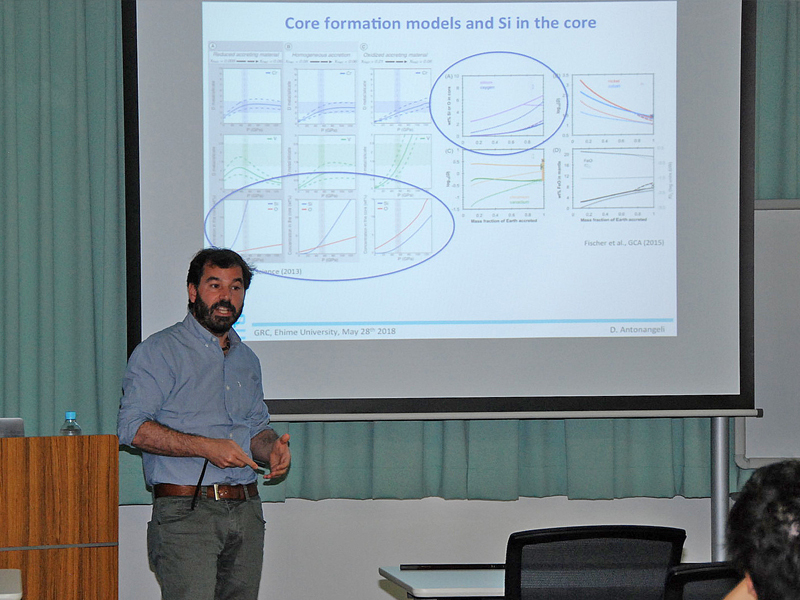 Combined with further constraints coming from melting curve determinations, these results will be used to discuss the Si abundance in the Earth’s inner core.